If you are thinking about purchasing a home, how do you calculate your estimated York County South Carolina property taxes? We did an article back in 2008 titled ?“IT?S PROPERTY TAX TIME IN YORK COUNTY SC ? FORT MILL, TEGA CAY RAISE MILLAGE RATES” which is very popular this time of year. The article gives in-depth instructions on how York County SC calculates your property taxes each year. We thought we would provide you with updated property tax info and links. Property taxes are due no later than Jan 15th, without late payment penalties. If you own property within York County SC, you normally receive your tax bill around the middle of October. If you didn’t recieve your tax bill, You can view your taxes and pay your tax bill online at onlinetaxes.yorkcountygov.com/taxes. 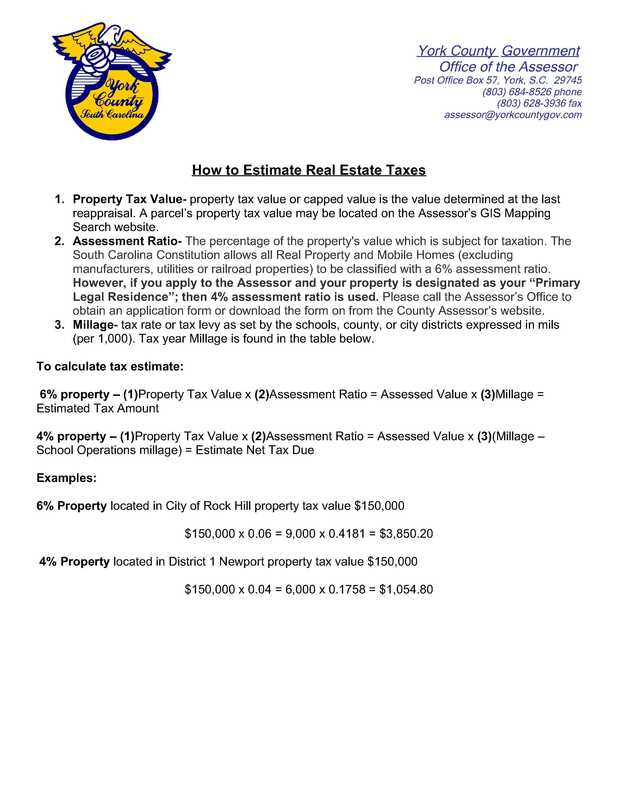 If you are thinking about purchasing a home and what to estimate your taxes for Your County SC, here is how to estimate your property taxes. Note: If you don’t live on the property (except manufacturing), you will be accessed at a 6% rate plus the 6% listed millage rate. If you will live in your home, you will need to complete your application for special assessment with the Tax Assessor’s office. ?After the 4% application has been accepted, the Auditor?s Office will issue a new tax notice at the 4% assessment. County links – there are three different County departments that play a role in your property taxes.